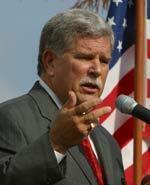 Mike Dow was Mayor of Mobile from 1989 to 2005. Dow served three-tours in Vietnam as a helicopter door gunner from 1966 to 1968. He then attended the University of South Alabama on the G. I. Bill. Dow received his bachelor's in economics in 1971 and his master's in business administration, with an accounting focus in the Mitchell College of Business, in 1977. He joined his brother-in-law Jim Busby’s laser printer company QMS in 1977. QMS was eventually taken public. Dow left QMS to run for mayor in 1988, when he won over Arthur Outlaw. Among Dow’s accomplishments as mayor is the downtown “String of Pearls” initiative. After deciding not to run for reelection in 2005, Dow joined Jim Busby’s new company CentraLite as Executive Vice-President of Sales and Marketing.